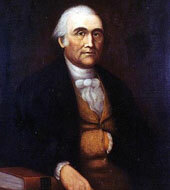 Robert Smith served as Secretary of State under President James Madison from March 6, 1809, until April 1, 1811. Smith’s controversial appointment and clashes with Madison influenced his service as Secretary of State. Smith was born in Lancaster, Pennsylvania. His family relocated to Baltimore, Maryland, where his father became a leading merchant. Smith graduated from the College of New Jersey (now Princeton University) in 1781. After serving briefly as a Private in the Continental Army, Smith studied law, joined the Maryland bar, and headed a leading admiralty practice in Baltimore. Smith served as a presidential elector of Maryland in 1789. He became a member of the Maryland Senate in 1793 and then the Maryland House of Delegates in 1796, where he served until 1800. In 1798 he was also elected to the Baltimore City Council. Recognizing Smith’s knowledge of maritime law, President Thomas Jefferson appointed him Secretary of the Navy in 1801, a position he occupied until he became Secretary of State in 1809. Smith’s difficult relationship with President James Madison began upon his appointment as Secretary of State. Madison’s first choice for the position was Albert Gallatin, Secretary of the Treasury. However, Smith’s supporters in the Senate, including his brother Samuel Smith, balked at the selection of foreign-born Gallatin and advanced Robert Smith. When Smith assumed the position of Secretary of State, Madison and Gallatin were poised to undermine his authority and seek his ouster. By remaining close to Madison’s rivals in the Senate, Smith ensured a continuing climate of disfavor. Madison, who had served as Secretary of State for eight years, did not trust Smith’s competence in the position and redrafted many of Smith’s diplomatic notes. Smith’s major diplomatic mission to improve relations with Great Britain proved a failure. Advised by Madison, Smith entered negotiations with David M. Erskine, the British Minister at Washington. The two intended to stabilize relations between the United States and Britain by restoring neutral trading rights during the Napoleonic War. Unfortunately, Erskine overstretched his authority, offered too many concessions, and failed to convey British Foreign Minister George Canning’s central requirement for an agreement: that the United States agree not to trade with the French for the duration of Britain’s war with France. This omission doomed the 1809 Smith-Erskine Agreement, which stipulated a cancellation of the British Orders in Council respecting the United States and the opening of U.S. trade with Britain. Canning informed the House of Commons that Erskine had violated his instructions and that the agreement would not be upheld. When Madison and Smith finally read Canning’s instructions to Erskine, they concluded that Canning had never intended to reach a settlement. Frustration over the agreement’s failure helped propel the two countries into the War of 1812. In March 1811 Gallatin asked Madison to dismiss Smith from the Cabinet and threatened to otherwise resign. Madison consented and offered Smith the post of Minister to Russia, hoping to quash Smith’s future chances at high office. Smith refused the mission and retaliated in a published address, hoping to topple the Madison Administration. However, like Edmund Randolph who had criticized President George Washington, Smith was unable to tarnish the public prestige of the Presidency. He resigned on April 1, 1811, and did not return to government service.